The last painting of a series of four commissioned from local artist Teresa Boast by Bulmer & Lumb was finally delivered to the site at the beginning of March. 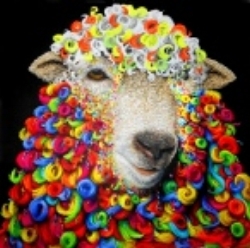 The final piece entitled "To Dye For" completes the set; showing different sheep interpreted in a colourful way representing the company's dyeing heritage. The final picture entitled "To Dye For"
Managing Director David Midgley with the artist Teresa Boast and the finished picture. Bulmer & Lumb were recently invited to a presentation ceremony at Plaisterer's Hall in London to celebrate the success of trainee dyer Ed Naylor in completing his Textile Colouration Certificate. The Worshipful Company of Dyers helped to support Ed through his training via the Livery Companies Apprenticeship Scheme which was set up in 2012. Ed was presented with his certificate by The Rt Hon the Lord Mayor, Alderman Dr Andrew Parmely & introduced by the Prime Warden of the Worshipful Company of Dyers Gerald Rothwell. Completion of the TCC will now enable Ed to continue his studies by taking on the new & revised ASDC syllabus, delivered by the SDC through its virtual learning environment (VLE). Students using the VLE can choose to study from wherever they are in the country, making the course accessible to all. The third painting in a series commissioned by Bulmer & Lumb from local artist Teresa Boast, is now on the easel. The paintings all feature sheep looking a little more colourful than usual to relfect the company's colouration expertise. 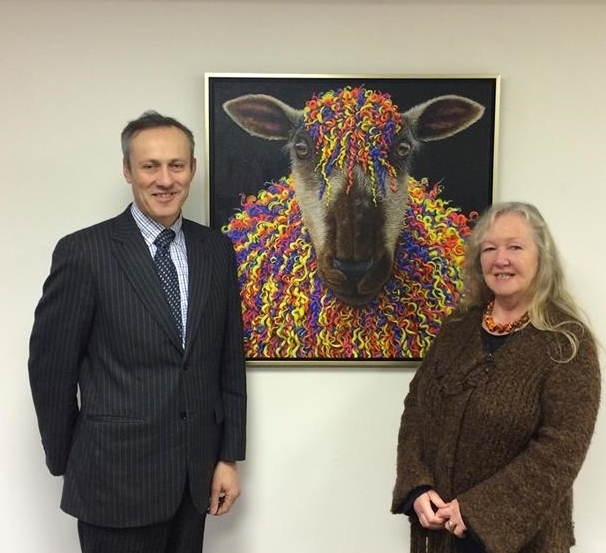 Bulmer and Lumb Group are delighted to be able to support local artist Teresa Boast, through a series of commissioned paintings featuring sheep. Two of Bulmer & Lumb's trainees have recently been celebrating exam success with the news that they have both achieved the Textile Colouration Certificate. Ed Naylor & Alana Williamson have both undertaken he SDC (Society of Dyers & Colourists) technical qualification as part of their ongoing study as Trainee Dyers at Bulmer & Lumb. The pair will be presented with their awards at the Society's upcoming "Day of Celebration" on May 19th 2017. At their recent AGM , held during the "Day of Celebration" in York, The Society of Dyers & Colourists made three new appointments to their Board of Trustees. This included Bulmer & Lumb's Technical Director, Paul Hamilton, who has been a member of the SDC since 1990. Beginning his career with Bulmer & Lumb Group in 1985, Paul was appointed Technical Director in 2013 and has worked closely alongside the SDC to develop & establish the Textile Colouration Certificate qualification. The reintroduction of a relevant techincal colouration course has been of great benefit to both Bulmer & Lumb's trainees and those throughout the UK, creating a stepping stone to the ASDC qualification. The SDC is an educational charity & professional chartered society which has educated & represented members of the industry for the last 125 years. On 20th May 2016, a party from Bulmer and Lumb Group gathered in York at the Merchant Adventurers Hall to receive awards from the Society of Dyers and Colourists for the completion of the Textile Certificate. Bulmer and Lumb are proud to support this technical qualification which lasts over three years, we currently have four apprentices at various stages all who through a combination of online lectures, residential days and final examination have achieved sufficient grades to progress onto the next year of the qualification. The awards were part of the annual "Day of Celebration" held by the SDC encompassing the Society's AGM, President's Reception & Celebration Dinner & is attended by members from all corners of the globe. This year’s recipients include Brett Gray and James Barraclough who have both completed Year 1 of the Textile Colouration Certificate, and Alana Williamson and Edward Naylor both who have completed year 2 of the course. Technical Director Paul Hamilton received a Society of Dyers and Colourists Silver Medal award to recognise his dedicated support of the Society’s training programmes. Paul was involved in the establishment of the TCC course, which Bulmer and Lumb consider essential in the training of the next generation of technicians. Developing the skills of these trainees through formal qualifications is necessary for the continued success of a company such as Bulmer and Lumb Group; who have a worldwide a reputation for colour matching excellence. “At Bulmer and Lumb we take pride in our reputation for the quality of shade matching we provide; and in the wealth of knowledge and experience our current management and technical team have. We work hard to achieve our aim to pass on these skills to future Dyers. We currently have three ASDC qualified members of the management team and it is our ambition to supplement these in time with the next four, which is why we continue to work with the SDC in its efforts to train the next set”. More information about the Textile Colouration Certifcate & the work of the SDC can be found here on their website. A party of Directors from Bulmer & Lumb Group were invited by Lloyds Bank to tour the Manufacturing Technology Centre in Coventry. Established in 2010, with the aim of integrating industry & academia, the MTC has the mission to “inspire great British manufacturing”. The site is one of the largest public sector investments in manufacturing to date. It is a purpose built site, located on what was previously an airfield. The centre houses some of the most advanced technology available in the UK, including 3D printing, laser technology, virtual engineering and advanced robotics. The MTC now employs 400 staff, has over 85 industrial members and spans a wide range of manufacturing sectors. The Lloyds Bank Adanced Manufacturing Training Centre, openend in November 2015 is located next door to the original MTC and aims to address the skills shortage currently facing the UK's manufacturers. 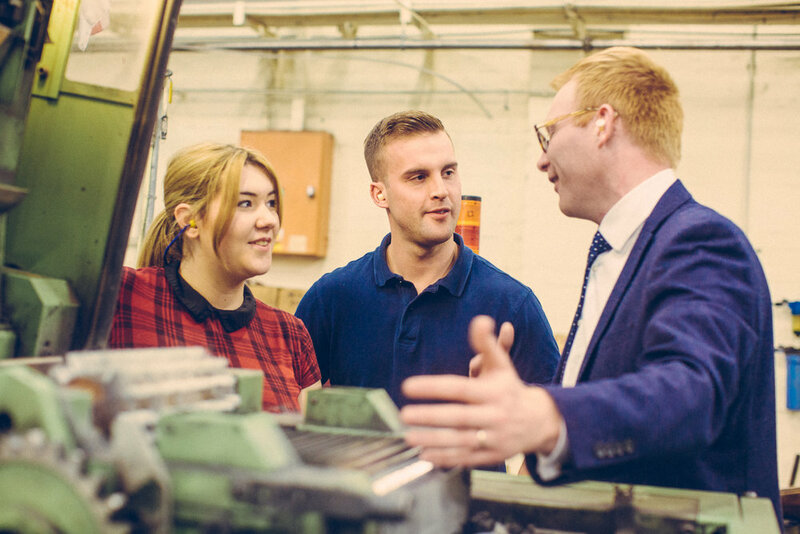 The centre specialises in training young engineers, supplies SMEs and companies in the manufacturing supply chain with skilled apprentices, and up-skills those already working in manufacturing. The facility offers the capability of simulating, modelling and the use of virtual reality to reduce the risk of introduction of such new technologies into existing businesses. It was initially set up with companies such as Jaguar and Hewlett Packard but is now offering its services to SMEs. Directors Matthew Whitehead & David Midgley outside the centre. Finance Director, Matthew Whitehead commented: "The Manufacturing Technology Centre in Coventry showcases the cutting edge of manufacturing technology and gives an insight into what tomorrow’s manufacturing could be like. The 3D metal printing technology was of particular interest. If this technology becomes mainstream, then in the future every manufacturer may have a 3D printer. Rather than ordering a new machine part, pipe, etc… the company could print it on site, reducing the down time of machinery and requirement to carry an inventory of parts."